At ripe, we believe that "design" is not just a finished product, but a process. When working on a project we take a client's content, target audience, and business objectives into account before ever setting pencil to paper. We believe that good design does not sacrifice art or functionality, but is rather a marriage of both. We have no single formula for good design; each solution is as unique as each challenge. ripe offers marketing design and production expertise in the areas of: identity, web design, publication, promotion, packaging, video and photography. We pride ourselves in producing unique and original design solutions in-house with dedication to client service and top quality work. In addition to our many accolades, ripe is also the premier green design firm in DC, offering sustainable solutions to any design problem. In fact, we were the first firm in the area accepted into the Designers Accord. 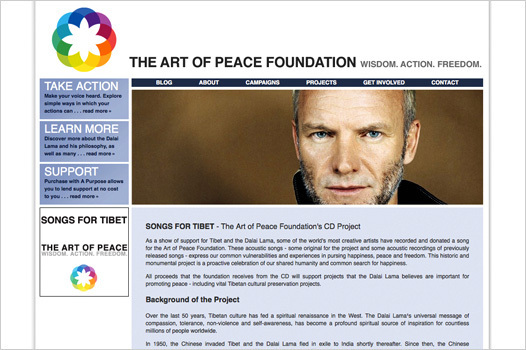 Art of Peace Foundation in conjunction with His Holiness the Dalai Lama, and several noted musicians (Sting, Dave Matthews, John Mayer, Suzanne Vega, Rush, Duncan Sheik and others), the Foundation strives to find peaceful ways to resolve the Tibet conflict. The Art of Peace Foundation contacted ripe to create their logo, web site and CD packaging. The web site is clean, modern and appealing and is amplified with startlingly beautiful imagery by the Dalai Lama's official photographer.